‘There is, however, another science which, provided one essential precondition is fulfilled, can provide a much more accurate dating – to within a few decades – of uninscribed ancient stone monuments. This is the science of archaeoastronomy. The precondition upon which it depends for its successful functioning is that the monuments studied should have been accurately aligned to the stars or to the rising points of the sun by their builders. The Great Sphinx fulfils this precondition. It lies exactly along the east-west axis of the Giza necropolis with its patient and eternal gaze set perfectly towards due east. It is, therefore, a superb ‘equinoctial marker’: its eyes target the exact position of sunrise at dawn on the spring equinox. To clarify matters a little, astronomers speak of four ‘cardinal moments’ in the year: the summer solstice – the longest day in the northern hemisphere – when the earth’s north pole points most directly at the sun, the winter solstice, the shortest day, when the pole points most directly away from the sun, and the spring and autumn equinoxes when the earth lies broadside-on to the sun and when night and day are of equal length. 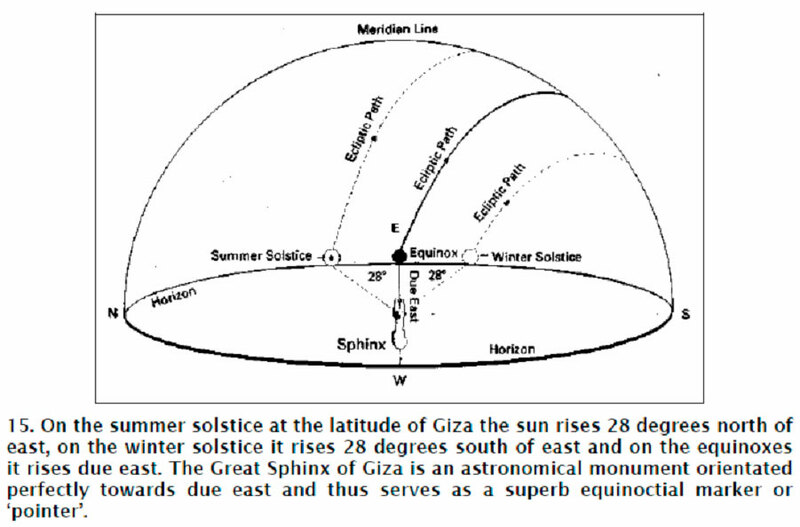 On the summer solstice at the latitude of Giza, the sun rises about 28 degrees north of east. On the winter solstice it rises about 28 degrees south of east. By contrast, the main characteristic of the equinoxes (here and everywhere else around the globe) is that the sun always rises due east providing a sure and accurate geodetic reference to one of the cardinal directions. 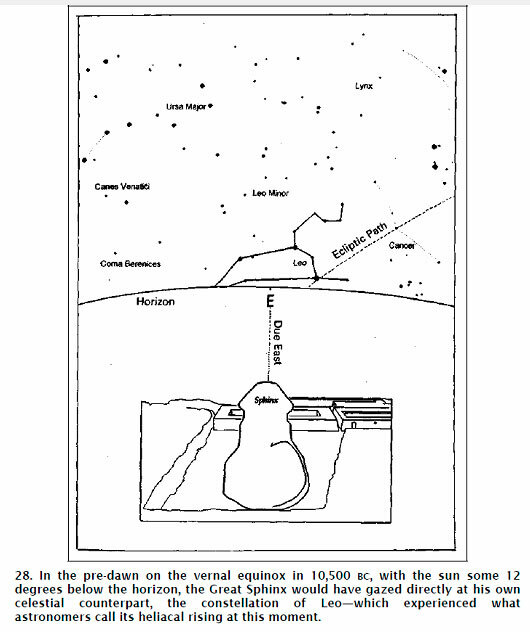 In Sensei of Shambala (Book IV) the Great Sphinx’s role in the ancient astronomical plan is mentioned twice. It actually plays the main, paramount role in the literal sense of the word. Let me proceed to the theory: source. To find stars in the sky, compose star maps, determine time and geographic coordinates, one should know coordinates of relevant stars. For this the equatorial coordinate system is applied, which is similar to the geographic coordinate system on the globe (see image below). We can estimate locations of stars in degrees on the celestial sphere relative to the celestial equator, just like we estimate angular distances from various cities to the terrestrial equator on a globe or world map (such distance is called the geographic latitude). The angular distance from heavenly bodies to the celestial equator is called declination. Declinations marked with the lower-case letter Delta (δ) in the southern hemisphere of the celestial sphere are considered negative. Coordinate systems. Left – relative to the horizon; height h and azimuth A; right – relative to the celestial equator: right ascension Alpha and declination Delta. For example, the geographic longitude or right ascension of 3 hours 10 min. 20 sec. makes 47°35'00". It’s easy to understand stars culminate one after another along with the increase of their right ascension. 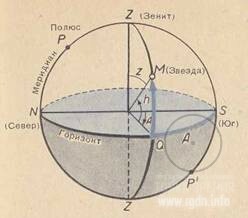 Declination and right ascension (Alpha and Delta) are called the equatorial coordinates. For stars they change so slowly that we may consider them invariable, unless we need a special precision. 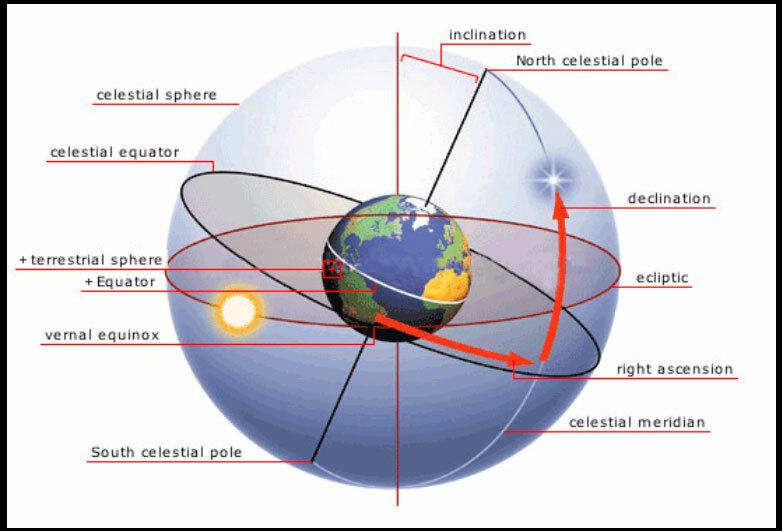 While the celestial sphere daily rotates, the vernal equinox point rotates along with it. Thus, locations of stars relative to the equator and the vernal equinox point depend neither on the time of the day nor on the observer’s place on the Earth. Addendum IV contains a list of Alpha and Delta coordinates for several bright stars. The same coordinate grid is depicted on the interactive night sky map. The Sun, the Moon and the planets permanently move against the star background. Therefore, they are not depicted on the map (their coordinates on each day of the year are published in special astronomical calendars). 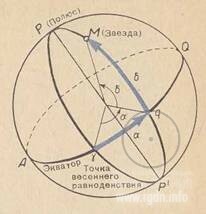 Upon daily rotation of the celestial sphere location of stars relative to the celestial equator does not change. 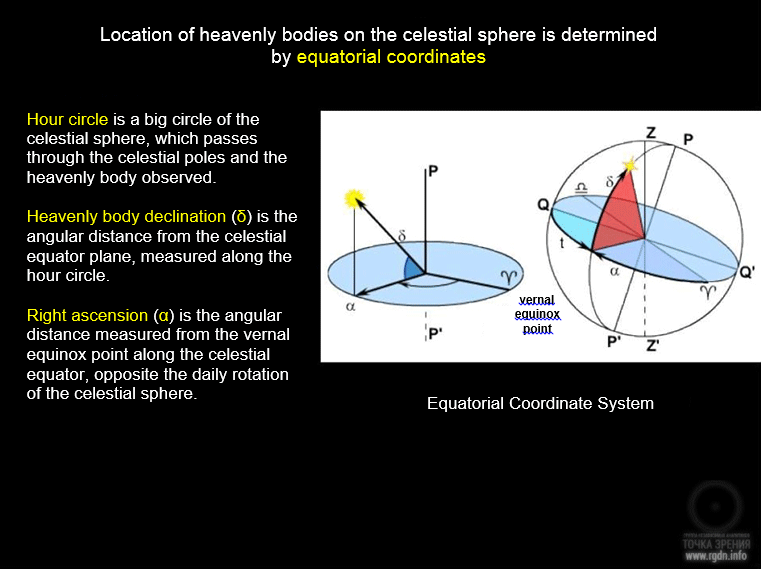 Therefore, equatorial coordinates are used for drawing of star maps and atlases. The Great Sphinx lies exactly along the east-west axis, and its eyes target the exact position of sunrise at dawn on the vernal equinox. It is, therefore, a superb ‘equinoctial marker’. 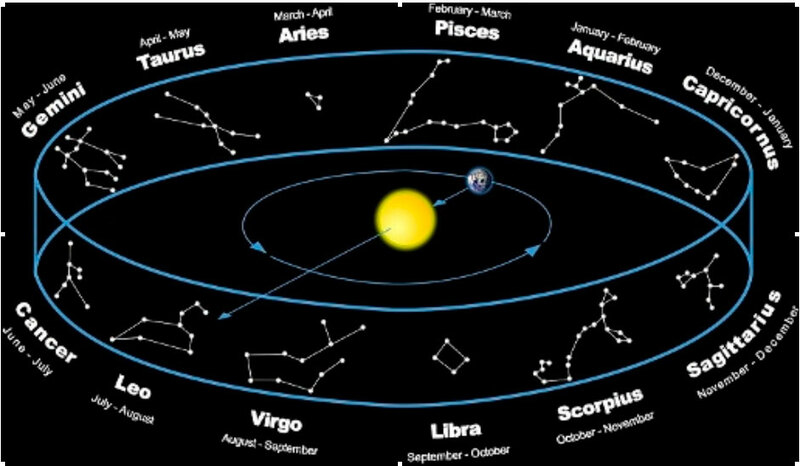 In the equatorial coordinate system, the second coordinate that determines a star location in the sky (equivalent to the geographic longitude) is the right ascension measured from the vernal equinox point. 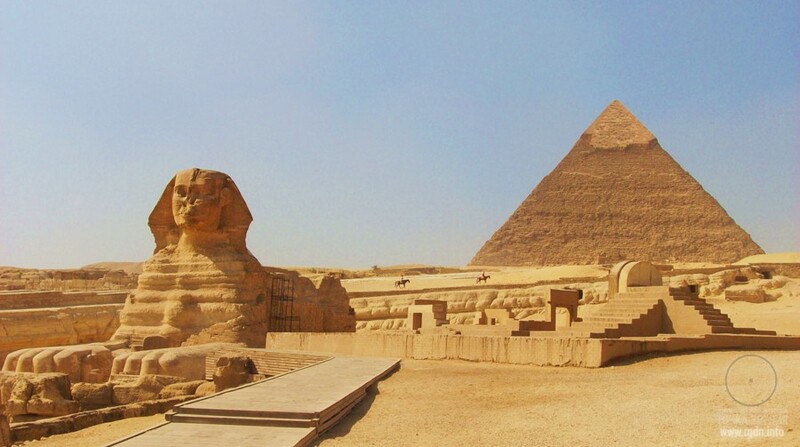 According to SENSEI OF SHAMBALA (Book IV) by A. Novykh, the Great Sphinx was the main reference point for construction of the stepped pyramid in Saqqara and the pyramids of the 4th Dynasty. 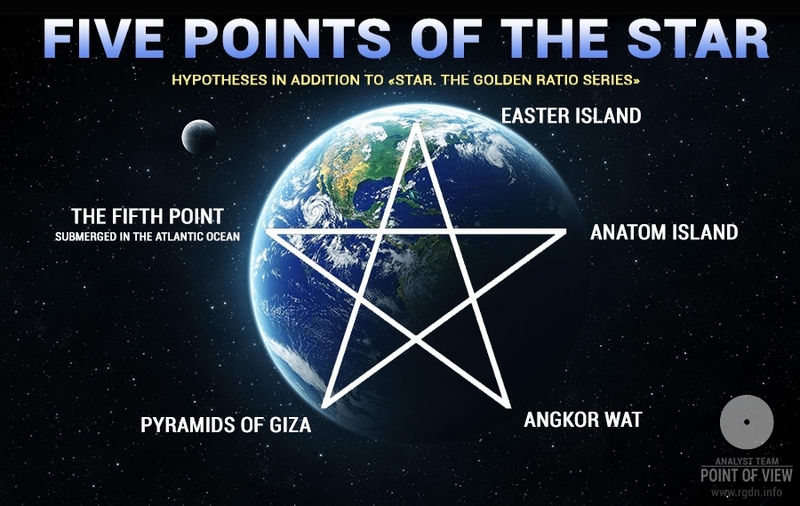 The pyramids were built by a star map, where the Great Sphinx was the primary point – the point that symbolized the vernal equinox on the Earth, while all other points on the map were arranged relative to such primary point. Because of the advanced geodetic and geographic science of the Egyptians, Egypt became the geodetic centre of the known world. Other countries located their shrines and capital cities in terms of the Egyptian ‘zero’ meridian, including such capitals as Nimrod, Sardis, Susa, Persepolis, and apparently even the ancient Chinese capital of An-Yang… As each of these geodetic centres was a political as well as a geographical ‘navel’ of the world, an omphalos, or stone navel, was placed there to represent the northern hemisphere from equator to pole, marked out with meridians and parallels, showing the direction and distance of other such navels. For some reason the authors of the above quote don’t take into account Egypt was not only the centre of geodesy and geography, but the unquestionable centre of astronomy and observation of stars as well, whereas the first so-called navel was the Giza plateau or more specifically the Great Sphinx. 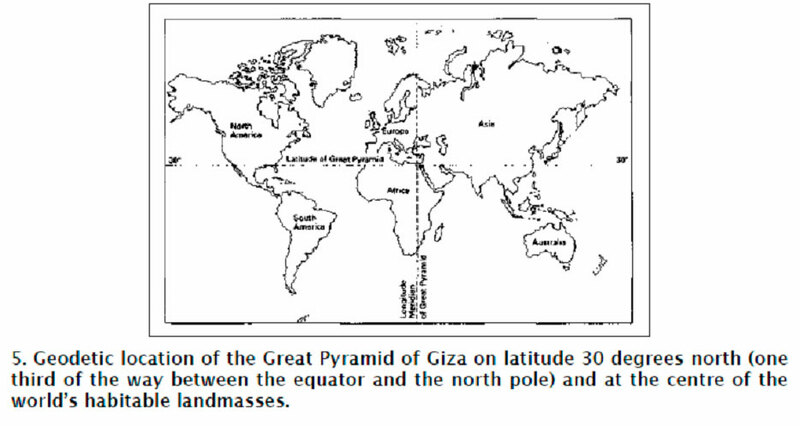 Should we look on the map, we can see Giza being almost at the centre of the world’s habitable landmasses. ‘The vast cosmic engine of the earth’s axial wobble offers us a mechanism by which this can be done: we need only instruct our computer to track the precessionally induced movements of the stars backwards in time. 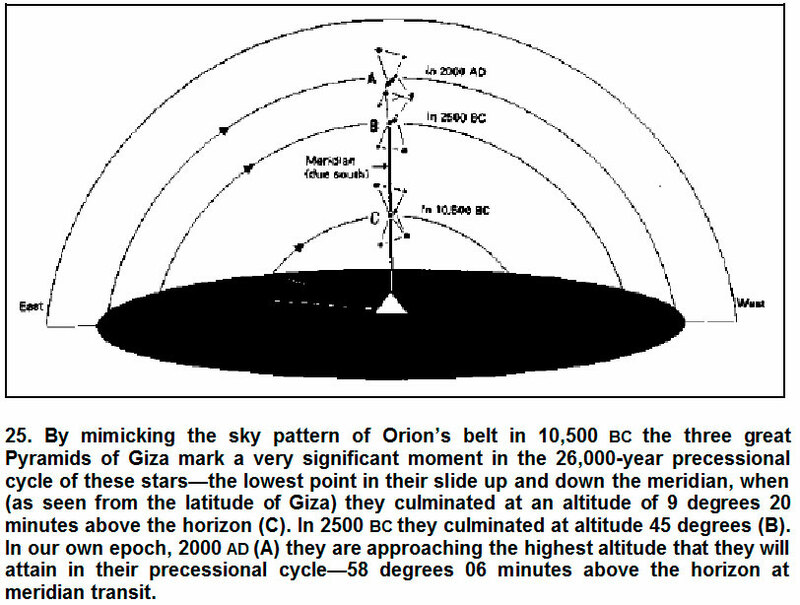 As it does so, millennium by millennium, we observe that the orientation of Orion’s belt at culmination is slowly rotating anti-clockwise and thus approaching ever closer to our desired meridian-to-meridian match. 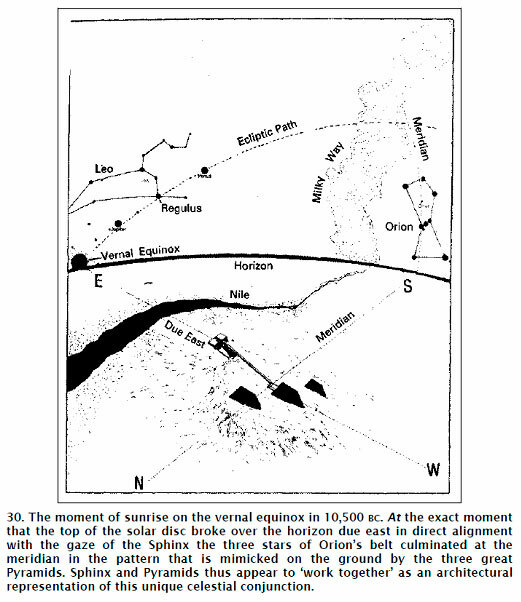 It is not until 10,500 BC, however – 8000 years before the ‘Pyramid Age’ – that the perfect correlation is finally achieved with the Nile mirroring the Milky Way and with the three Pyramids and the belt stars identically disposed in relation to the meridian. 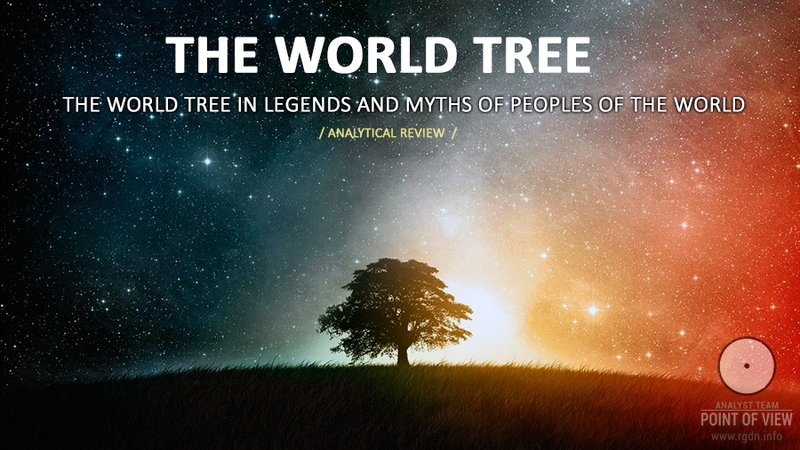 There is a feature of this 10,500 BC correlation which suggests strongly that coincidence is not involved. The pattern that is frozen into monumental architecture in the form of the Pyramids marks a very significant moment in the 25,920-year precessional cycle of the three stars of Orion’s belt – one that is unlikely to have been randomly selected by the Pyramid builders. It will never fall lower, the epoch of 10,500 BC marks the nadir of the star’s precessionally induced slide up and down the meridian (just as the epoch of AD 2500 marks its zenith). Like a slowly moving lever in a narrow vertical slot, it takes 12,960 years to descend from top to bottom, and a further 12,960 years to ascend from bottom to top again. 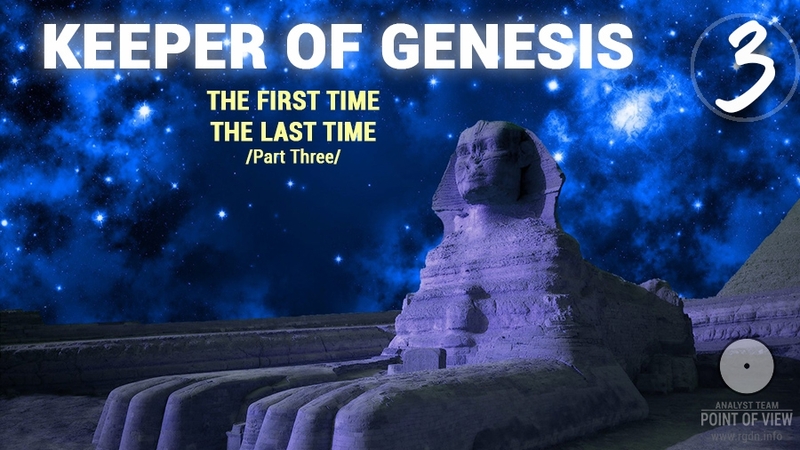 ‘As was pointed out in Fingerprints of the Gods, the same role is played by the Great Sphinx – which gazes directly at the equinoctial rising point of the sun in any and every epoch, past, present and future, forever. In our own epoch the sun on the spring equinox rises against the stellar background of the constellation of Pisces, as it has done for approximately the last 2000 years. The ‘Age of Pisces’, however, is now approaching its end and the vernal sun will soon pass out of the sector of the Fishes and begin to rise against the new background of Aquarius. To be precise, it takes exactly 2160 years for the equinoctial point to pass completely through one constellation or ‘house’ of the zodiac. With this process in mind, let us now reverse Santillana and von Dechend’s ‘precessional clock’. 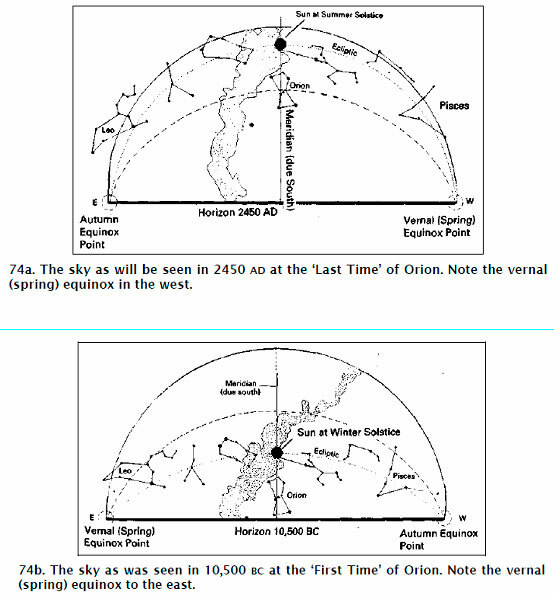 Passing back through the Age of Pisces (and the Age of Aries that preceded it) we find that in the epoch of 2500 BC, when the Sphinx is conventionally assumed to have been built, it was the constellation of Taurus that housed the sun on the spring equinox. 1. The Sphinx, as we have seen, is an equinoctial marker – or ‘pointer’. 2. On a site that is as profoundly astronomical as Giza one would naturally expect an equinoctial monument dating from the ‘Age of Taurus’ either to have been built in the shape of a bull, or at any rate to symbolize a bull. The Sphinx, however, is emphatically leoninein form. 3. It is a simple fact of precession that one must go back to the ‘Age of Leo’ beginning at around 10,500 BC, in order to obtain the ‘correct’ sky-ground symbolism. This, as it turns out, is the only epoch in which the due-east-facing Sphinx would have manifested exactly the right symbolic alignment on exactly the right day – watching the vernal sun rising in the dawn sky against the background of his own celestial counterpart. To clarify this latter notion, let us return to our computer simulation of the skies over Giza in 10,500 BC, instructing the program to recreate the positions of the sun and stars just before dawn on the spring equinox in that epoch. And let us set our direction of view due east in line with the gaze of the Sphinx. 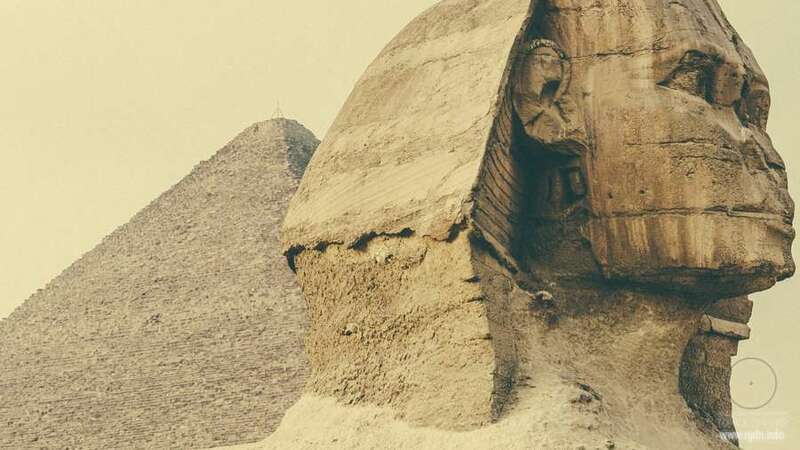 Indeed, with the aid of a little virtual reality and poetic license, let us imagine that we are standing between the paws of the Sphinx itself at that date – a date that we already know accords rather well with the geologyof the monument. What we would see, occupying the portion of the sky into which the sun is about to rise, would be the splendid zodiacal constellation of Leo – a constellation that very strongly resembles its namesake the lion and thus also the leonine Sphinx. The minutes pass. The sky begins to lighten. Then, at the exact moment at which the top of the solar disc breaks over the horizon directly ahead of us we make a 90-degree right turn – so that we are now looking due south. 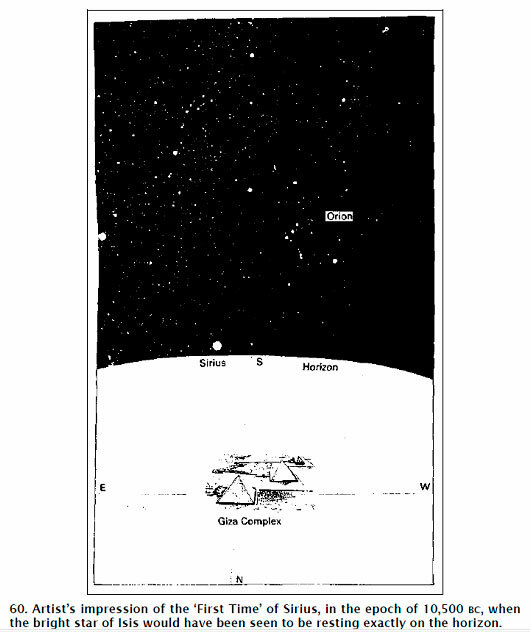 There, culminating at the meridian at altitude 9 degrees 20’, we observe the three stars of Orion’s belt forming a pattern in the sky that is identical to the ground plan of the Giza Pyramids. 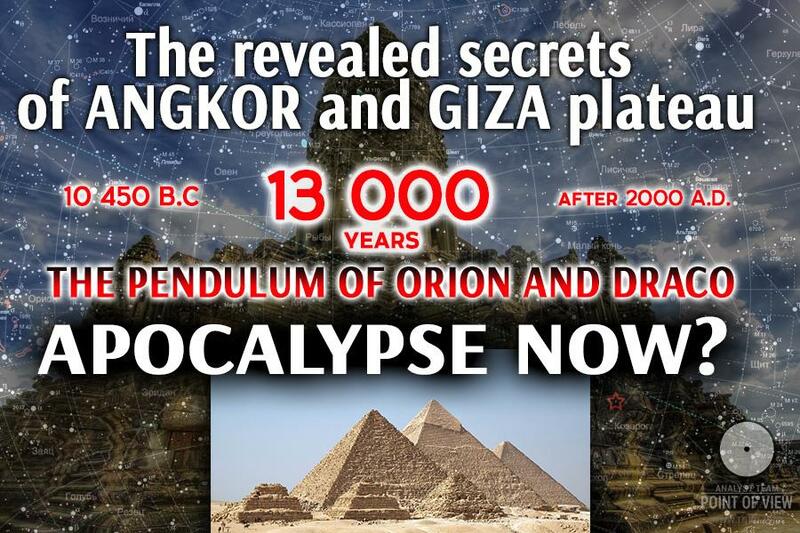 The question reduces to this: is it a coincidence, or more than a coincidence, that the Giza necropolis as it has reached us today out of the darkness of antiquity is still dominated by a huge equinoctial lion statue at the east of its ‘horizon’ and by three gigantic Pyramids disposed about its meridian in the distinctive manner of the three stars of Orion’s belt in 10,500 BC? And is it also a coincidence that the monuments in this amazing astronomical theme park manage to work together – almost as though geared like the cog-wheels of a clock – to tell the same ‘time’? ‘Another bit of the 10,500 BC ‘jackpot of correspondences’ concerns the star Sirius, which symbolizes the very heart of the ancient Egyptian mystery. All stars, including our own sun (and our solar system with it) move through space. Because of the vast distances involved, however (hundreds and often thousands of light-years), this ‘proper motion’ registers barely perceptible effects on the positions in the skyof the majority of stars as viewed from earth. Where these stars are concerned the only significant factor is precession (which, as we know, is a perceived ‘motion’ that is actually caused by a wobble on the axis of the earth). Sirius is one of the major exceptions to this rule. As many readers will be aware, it is the brightest star in the sky. It is also one of the neareststars to earth, being only 8.4 light-years away. Because of this proximity it registers a very large ‘proper motion’ in space relative to our own solar system – large enough to bring about observable changes in its celestial address, over and above those caused by precession, within just a few thousand years. 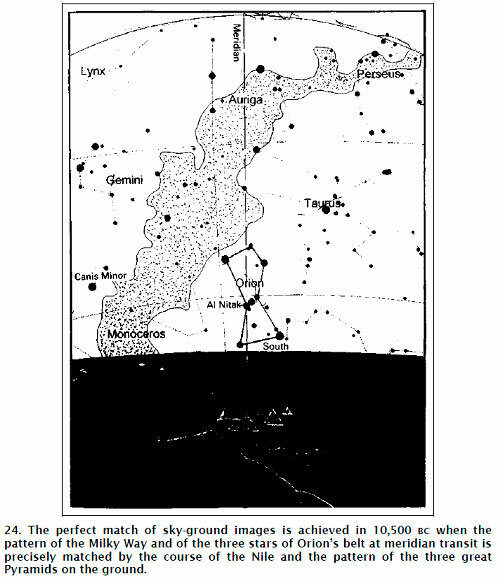 In 10,500 BC quite an interesting and beautiful picture could be observed in the starry sky at the latitude of Giza. The Great Sphinx looks to the east, straight at his celestial counterpart – the constellation of Leo. The three stars of Orion's belt are in their lowest position (they cannot go lower) after which they will be moving upwards during the next 13,000 years. Sirius rests exactly on the horizon. “Four ways will appear before their eyes. 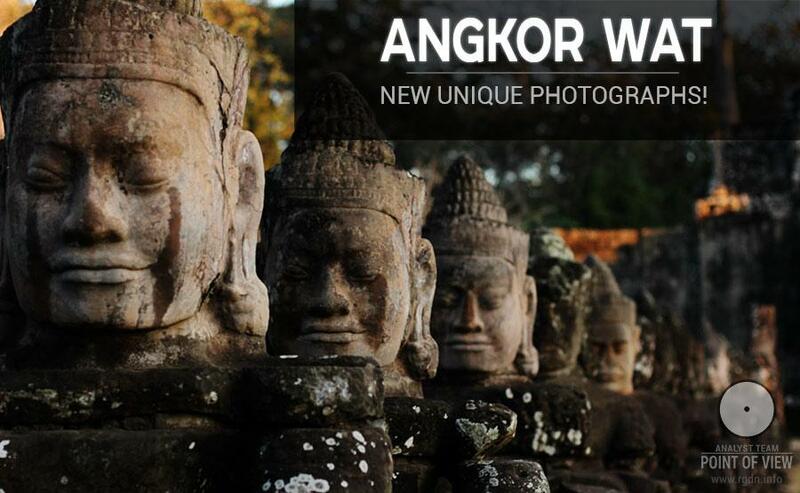 May Ahura’s Will be done!